Use Terminal to enable Safari's debug menu. With the release of Safari 4 in the summer of 2008, many of the most useful menu items in the Debug menu were moved to the new Develop menu. But the hidden Debug menu remained, and even picked up a command or two as Safari development continued. Apple made accessing the hidden Develop menu an easy process, only requiring a trip to the Safari's preferences. Accessing the Debug menu, on the other hand, is a bit more complicated. 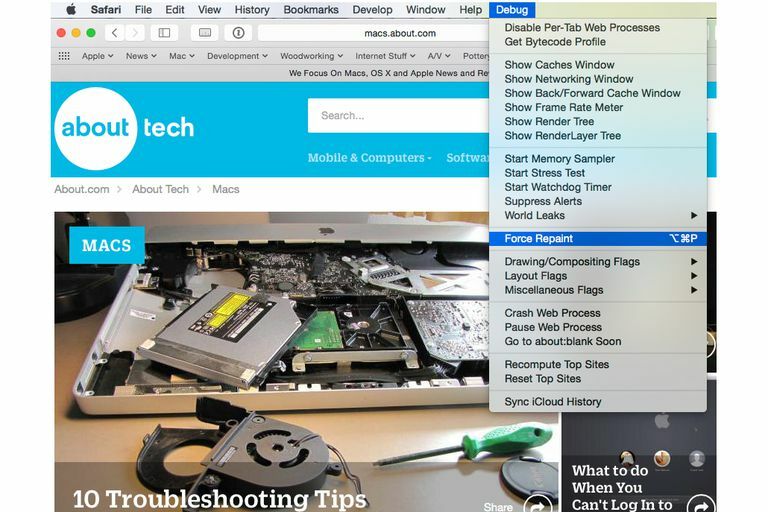 Enabling the Safari debug window requires the use of Terminal, one of our favorite tools for accessing hidden features of OS X and its many apps. Terminal is pretty powerful; it can even make your Mac start singing, but that’s a bit of an unusual use for the app. In this case, we're going to use Terminal to modify Safari’s preference list to turn the Debug menu on. Enter the following command line into Terminal. You can copy/paste the text into Terminal (tip: triple-click in the line of text below to select the entire command), or you can simply type the text as shown. The command is a single line of text, but your browser may break it into multiple lines. Be sure to enter the command as a single line in Terminal. Relaunch Safari. The new Debug menu will be available. If for some reason you want to disable the Debug menu, you can do so at any time, again using Terminal. Enter the following command line into Terminal. You can copy/paste the text into Terminal (don’t forget to use the triple-click tip), or you can simply type the text as shown. The command is a single line of text, but your browser may break it into multiple lines. Be sure to enter the command as a single line in Terminal. Relaunch Safari. The Debug menu will be gone. Show Frame Rate Meter, which will display CPU load, page frame rate speed, and updates being made to the page, all in the form of analog speedometers. And, depending on the version of Safari you're using, the option to reset and recompute Top Sites.